Overcooked, bland, and dried out chicken is a common cooking stereotype for a reason. With practice it is possible to cook chicken perfectly using traditional methods but it is always a fine line between perfect and overcooked. Using sous vide always results in uniformly tender chicken that is very moist. Unlike some other ingredients where sous vide can radically change the ingredient, cooking chicken meat sous vide is mainly an act of convenience and consistency. The exception to this are chicken eggs, which can achieve textures not possible to get with traditional methods. I often use sous vide chicken as a basis for other dishes such as chicken marsala, chicken parmigiana, fried chicken, and other chicken dishes with a coating. First fully cooking the chicken sous vide, then applying and cooking the coating removes the guess work of trying to ensure the chicken is cooked through at the exact moment the coating turns nice and crispy. There is not a lot of variation between the various cuts of chicken and most recipes for white meat or dark meat can be used for either. Ill discuss the minor variations between the two kinds of meat. Chicken eggs are a different story and are discussed in detail below. Chicken breasts are an inherently tender meat so they do not benefit much from the long cooking times that sous vide allows. Therefore the main benefit of sous vide chicken is the ability to create a perfectly cooked chicken breast with very little effort. Cooking chicken sous vide also allows you to cook chicken to lower temperatures than would be safe using traditional techniques. This can result in chicken with a different texture when cooked below 140ºF and chicken that is much more moist when cooked below 147ºF. This is because water loss speeds up the hotter the meat gets, so keeping the temperature of the chicken below 147ºF slows down the loss of moisture. Most white meat is cooked for 1 to 2 hours and is fine for 3 to 4 hours. Any longer than that and the meat begins to get too tender and takes on a slightly mushy texture. The main difference between dark meat and light meat is that the fat content is higher in dark meat. This means it retains more moisture at higher temperatures and also needs to be cooked a slightly longer time to kill bacteria. Just like white meat, dark meat can safely be eaten at temperatures around 140ºF, however, it ends up tasting slightly undercooked. My preferred temperature, originally suggested by Jean-Francois, is 148ºF for 2 to 5 hours. This results in very tender and moist meat that still has some chew to it and tastes completely cooked through. 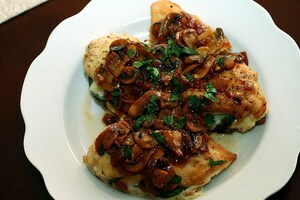 Some people suggest cooking the thighs for long periods of time at high temperatures to completely tenderize the meat. I've found this to result in dry, bland meat compared to chicken cooked at lower time and temperatures. However, if you need shredded chicken for a recipe this method can work well. Because of the similarities between the dark and light meat in chicken, cooking a whole chicken sous vide is pretty easy to do as long as your water bath is large enough. Cooking at the top range of moist white meat and the bottom of the dark meat range, around 148ºF will result in a uniformly tender and moist bird. One thing to keep in mind is that the chicken will normally be larger than a single breast or thigh would be, therefor it is better to increase the cooking time slightly to allow for it to evenly heat. Depending on the size of the bird an extra hour or so should be fine. Another minor point is that it is better to use a butterflied chicken instead of a whole one. This is because the cavity in a whole chicken will trap air and heat much slower. If you do use a whole chicken, it is worthwhile to increase the cooking time by an hour or two to compensate. Due to the moisture present in sous vide cooking chicken skin that was in the pouch can not really be made crispy. The best solution to this is to take it off of the bird before cooking the meat sous vide. As you get close to serving time, you can manually crispy the chicken skin. There are many methods that work, using a hot skillet with a little oil is normally quick. You can also brown it on a baking sheet in the oven set to 375ºF but make sure you use one with raised edges. There are three types of sous vide egg preparations that cannot easily be replicated using traditional means. They are soft- and hard-boiled eggs, scrambled eggs, and pasteurized eggs. Soft-boiled and hard-boiled eggs are traditionally made by placing eggs still in their shell into boiling water for a certain amount of time. The length of time spent in the water determines if they are soft-boiled or hard-boiled. 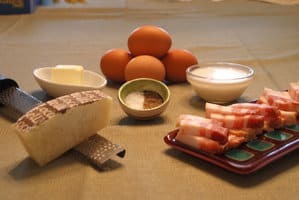 Eggs cooked in this manner suffer from the same issues as roasted meats: the outside is overcooked by the time the inside comes up to temperature. Just like for meat, cooking eggs sous vide solves this issue by bringing the entire egg up to a set temperature. In all cases you cook the eggs for around 45 - 60 minutes and the doneness of the egg is determined by the temperature of the water bath. 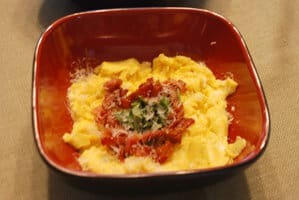 One type of scrambled eggs that is highly sought after is the French style, which results in a smooth, custardy scrambled egg as opposed to the more rubbery American version. Normally the French style is accomplished by lightly whisking the eggs in a double boiler over simmering water until they just begin to set. Using sous vide takes all of the manual labor and complexity out of the equation. You simply preheat your water bath to 165ºF and place a bag containing your scrambled eggs into it. After 10 minutes take the bag out and massage it gently. Place it back in the water bath for 5 more minutes. Remove it again, massage gently, then serve. For more information on this method refer to the Sous Vide Supreme recipe that popularized it. Many dressings, mixed drinks, and sauces call for raw eggs. However, this can be dangerous if the quality of the eggs available is not great or if you are serving young or old people who may have weaker immune systems. One way to enjoy these recipes while still being safe is to first pasteurize the eggs before using them. That will ensure that the eggs are safe and cooked but they will still behave very similar to raw eggs. To pasteurize the eggs preheat your water path to 135ºF and place the eggs, still in their shells, in for 1 hour and 15 minutes. At this point you can take them out and use them, or keep them in the refrigerator for a while until needed. Sous vide chicken is one of the easiest and fastest applications of sous vide cooking that there is. There are two different approaches, one for the chicken meat and another for the eggs. At it's simplest, sous vide chicken just entails sealing chicken breasts, legs, and / or thighs in a sous vide pouch with salt and pepper and other spices. You then cook it at 140ºF to 147ºF for 45 to 90 minutes, or up to 5 hours. Then sear the chicken in a hot pan or on a hot grill and serve it as you would normal chicken. Conversely, once you remove the chicken from the water bath you can use the pre-cooked chicken in any number of typical chicken preparations. 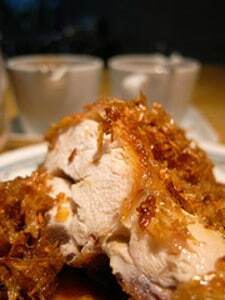 You can coat the chicken breast with flour and quickly deep fry it for moist fried chicken. You can cover it with a spice rub and quickly pan fry it for a great blackened chicken to use on a caesar salad or with beans and rice. Or you can just throw it on the grill for a minute on each side and brush BBQ sauce on it for a great BBQ chicken. Dark meat is handled very similarly to the white meat except for a slight increase in temperature and cooking time. My recommendation for a normal chicken thigh or leg is 148ºF for 2 to 5 hours. If you are making shredded chicken then the more tender, but less moist result of 160ºF for 8 to 10 hours should work very well. Just like the white meat, once the chicken is cooked you can then use it in any recipe or meal that calls for dark meat or sear it in a hot pan or on a hot grill and eat it. As stated above, the ideal temperature to cook a whole chicken is 148ºF because it is close to the ideal temperature range for both dark and white meat. Depending on the size of the bird, 148ºF for 4 to 6 hours will be a good amount of time. This should result in a bird with tender white meat as well as tender dark meat. If the bird is larger than normal you can add an hour or two and if it is butterflied you can subtract an hour or two. Cooking sous vide chicken eggs is also very simple. Just preheat your water bath to the desired temperature, from 135ºF for ?raw? to 158ºF for very hard boiled. Most people feel the temperature for the perfect egg is 148ºF and an equivalent of a poached egg is 142ºF. For good pictures of what the eggs look like at different temperatures we recommend the "Perfect Egg" section in the sous vide guide by Douglas Baldwin. Once you determine your temperature of preference you place the egg, still in its shell, into the water bath for about 45-60 minutes, or up to 2 hours. Once the time has passed you take the egg out and serve it as you would a normal soft or hard boiled egg. Let us know what sous vide chicken recipes you like and we'll link them up here. 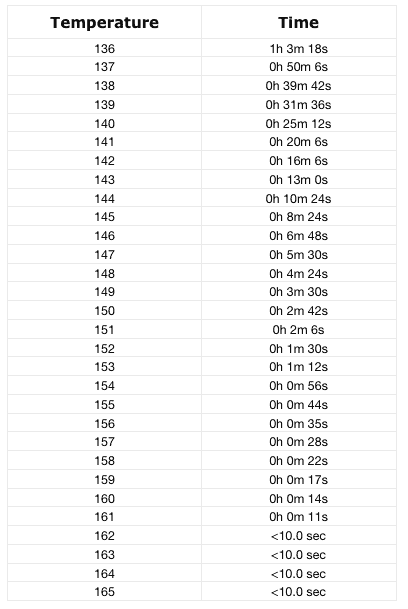 Here are our recommended cooking times for the various cuts of chicken meat. Note that the entries labelled as "raw" are actually completely cooked and safe to eat, they just have a more raw texture to them. 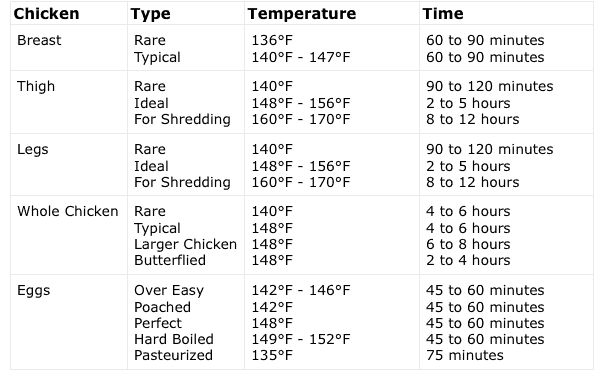 Here are the required cooking times from the USDA Guide to pasteurize 1% fat chicken. Jean-Francois has a very informative blog aboutsous vide and some less usual applications of it. The scrambled egg recipe for the Sous Vide Supreme.